B&B Butchers has a roasted prime rib dinner. Photo by Felix Sanchez. Time is drawing short for Thanksgiving 2018 and the order deadlines for several Houston restaurants have already passed. However, there are still some that are taking orders during those last few days leading up to the holiday. 51fifteen, The Galleria, 5175 Westheimer: Choose from two complete Thanksgiving feasts that feed up to 22 guests. The 10 to 14-pound slow roast young turkey plus sides serves 12 guests costs $150 and the the 20 to 24-pound slow roast turkey plus sides serves 22 guests costs $250. Both meals come with turkey stuffing, cranberry sauce, traditional gravy, green bean casserole, Brussels sprouts with bacon, sweet potatoes, mashed potatoes, pecan pie and pumpkin pie. Order by November 20 at 7 p.m. and pick-up November 21 before 8 p.m. Contact the restaurant at 713-963-8067 to order. B&B Butchers, 1814 Washington: Order a roasted prime rib dinner that comes with au jus, pommes purée and Yorkshire pudding that feeds 10 to 12 for $550 or five to seven for $300. Augment with traditional sides such as cornbread and sausage stuffing, candied yams, Brussels sprouts or cranberry sauce. Each side serves four for $60, six for $90 or eight for $110. A traditional turkey is also available for $6 per pound. There are pumpkin, apple crumb, key lime and pecan pies for $35 each. Orders must be placed 24 hours in advance by calling (832) 767-4828 and picked up beginning November 20. The Dunlavy, 3422 Allen Parkway: Update: deadline has passed. The Dunlavy has traditional and vegan Thanksgiving dinners. The turkeys are sourced from Whitehurst Heritage Farms and come with challah bread herbed stuffing, Wild Texas Mushroom and Green Bean Casserole, buttery mashed potatoes, pumpkin pie, turkey gravy, cranberry compote and a dozen Parker House rolls. Dinner costs $250 and serves between eight and 10 people. The vegan dinner is butternut squash with wild rice herb stuffing, Texas Wild Mushroom Gravy, Celery Root Mashed Potatoes, Texas autumn roasted vegetables, organic kale with chimichurri, cranberry pear compote, sourdough boule and a mini vegan pumpkin pie. The dinner serves two and is $65. See the complete menu and order online. Orders must be placed by noon on November 19 and can be picked up Wednesday, November 21st between 7 and 10 a.m. or 2 and 4 p.m.
Hungry’s Cafe, 2356 Rice and 14714 Memorial: Order a traditional Thanksgiving dinner that serves up to 10 people and includes oven-roasted turkey with brown gravy, cornbread stuffing, Garlic Mashed Potatoes with Poblano Mushroom Sauce, green beans, cranberry sauce, dinner rolls and a choice of apple, pecan or pumpkin pie for $170. Orders must be placed by noon on November 20 and be picked up on November 21. To order, call (713) 523-8652 for the Rice location and (281) 493-1520 for the Memorial location. Killen’s Barbecue offers a smoked turkey, but those who want a more Texan feel to Thanksgiving can consider ordering the brisket, instead. Photo by Robert Lerma. Killen’s Barbecue, 3613 E Broadway, Pearland: Indulge in a limited number of smoked turkeys available for $70 and pair them with an array of side dishes including baked beans, pinto beans, mac ’n cheese, creamed corn, coleslaw, potato salad, green beans and collard greens for $9 per quart. 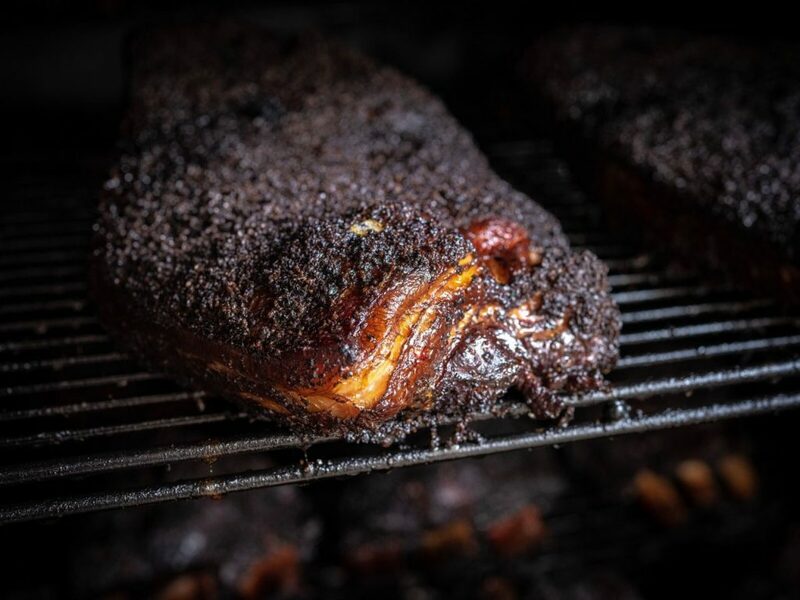 Ditch the turkey altogether and order Killen’s smoked brisket for $95. To place an order, email the restaurant at least 48 hours in advance. Killen’s will be open for order pick up on Tuesday, November 20 and Wednesday, November 21 from 11 a.m. to 8 p.m.
Kiran’s 2925 Richmond brings a touch of chef Kiran Verma’s signature Indian cuisine to the traditional Thanksgiving offerings, with a tamarind-glazed tandoori turkey dinner to serve 10 people. The 14- to 16-pound bird is accompanied by blood orange cranberry sauce; brioche stuffing with toasted walnuts, chicken keema and wild mushrooms; white wine gravy; three choices from green beans almandine, braised cabbage and Brussels sprouts, Aloo Methi (red new potatoes with fenugreek) or apricot and paneer biryani; and a choice of two desserts that include pumpkin or pecan pie or Cheesecake with fresh strawberries or carrot cake with ginger cream cheese icing. The cost is $350 for dinner for 10 or $45 for an individual order. All orders will be ready for pickup on Thanksgiving morning, Nov. 22, although earlier pickup may be arranged. To order email the restaurant or call (713) 960-8472 Updated 11/18/18 12:33 p.m.
Luby’s, Multiple locations: Luby’s offers multiple Thanksgiving options including a combination whole roasted turkey and spiral ham dinner that feeds between 10 and 12 people and comes with cornbread dressing, cranberry sauce, giblet gravy, a dozen dinner rolls and a pumpkin pie. The cost is $99.99. The complete menu is available online. All orders must be placed 48 hours in advance and pick-up times will be coordinated upon ordering. Call (877) 465-8297 and select 3 at the prompt. Molina’s Cantina, 7901 Westheimer and 3801 Bellaire: In lieu of traditional Thanksgiving trappings of turkey and sides, Molina’s offers ready-to-eat fajita packs. These include tortilla chips, chili con queso, pico de gallo, guacamole, salsa, carrot relish, Mexican rice, refried beans and pecan pralines. Each is priced per person and costs $17.95 for chicken, $19.95 for beef, $14.95 for veggie and $18.95 for a combo. Email Molina’s Catering to place an order and coordinate pick-up options. Ouisie’s Table, 3939 San Felipe:Update: deadline has passed. The River Oaks stalwart is ideal for large numbers of guests. 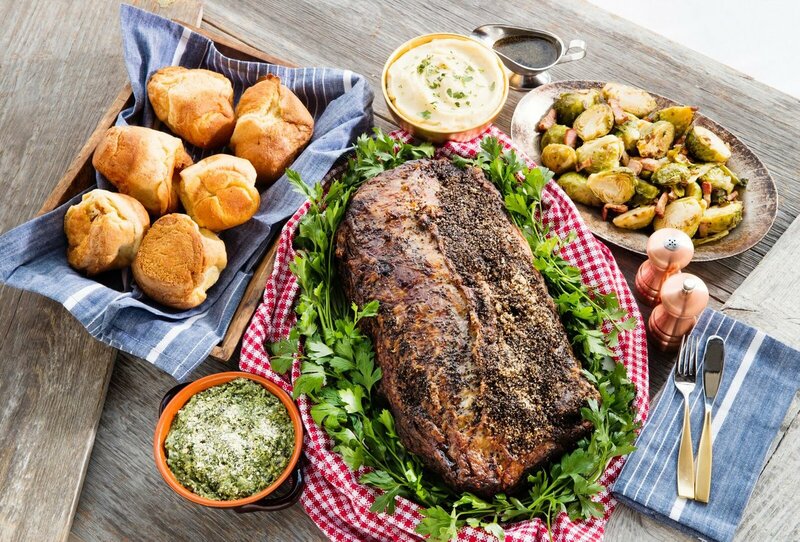 Dinner options include a Garlic-and-Pepper-Crusted Prime Rib of Beef dinner that serves between 15 and 20 people for $350 and a honey-glazed ham meal that serves between 20 and 25 for $175. Both come with a choice of two sides, and guests can select from green beans, Lobster-Mashed Potatoes, Cinnamon-Ginger Sweet Potatoes, cranberry sauce, mixed grilled vegetables, macaroni and cheese, wild rice with shallots or a Stilton salad. Dessert is available for an additional $50 with options such as tres leches, pumpkin pie, pecan pie or Italian cream cake. To order, call (713) 528-2264. All orders must be placed by Monday, November 19. Dinners must be picked up Wednesday, November 21 between 11 a.m. and 10 p.m.
Piatto Ristorante 4925 W. Alabama: The Carrabba Family-owned Italian spot has a traditional Thanksgiving to-go meal that includes roasted turkey, cornbread dressing, sweet potato souffle, green beans and artichoke hearts, cranberry orange relish and rolls. But there’s also (natch) an Italian option with lasagna, chicken Milanese (breaded chicken breasts with diced tomato and basil), Italian sausage and peppers, garlic mashed potatoes, Italian green beans, Johnny’s House Salad and dinner rolls. Pricing for six people for either dinner is $192; enough for 12 people is $360. Orders must be placed by Tuesday, Nov. 20. Guests may select a pickup time for Nov. 21 or Thanksgiving morning, Nov. 22. Call (713) 871-9722 to order. 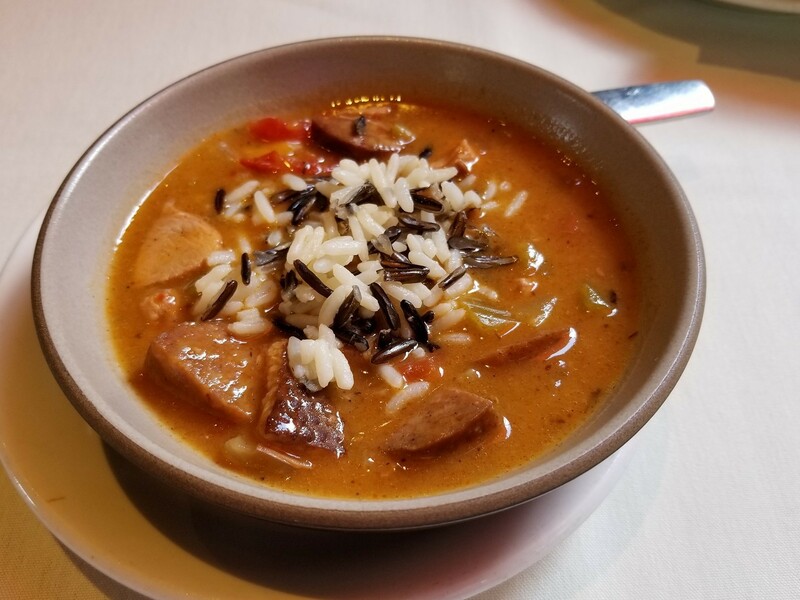 Updated 11/18/18 12:53 p.m.
A cup of Smoked Duck Gumbo at Rainbow Lodge. Photo courtesy of Rainbow Lodge. Rainbow Lodge, 2011 Ella: There are multiple a la carte options to create a custom dinner from Rainbow Lodge. The full menu is online with options like a 16-pound turkey and gravy that serves six to eight people for $89, a roasted beef tenderloin for $150, the lodge’s signature Smoked Duck Gumbo for $16 a quart and a selection of sides for $3.50 per person such as a roasted autumn vegetable mix, green beans with shallots, and wild mushroom risotto (minimum order is for four people). Orders must be placed 48 hours in advance by calling (713) 861 8666. Some options may no longer be available. Robard’s Steakhouse, 2301 Millbend: This traditional Thanksgiving dinner serves four, eight or 12 people. The to-go dinner includes Citrus-Brined Roast Turkey, Kale and Quinoa Salad, Poblano Cornbread Stuffing, Yukon gold mashed potatoes, green beans almondine, roasted rainbow carrots in a honey glaze and a choice of apple, pecan or pumpkin pie. Dinner is $198 for four, $396 for eight and $594 for 12. View the menu online place orders by emailing the restaurant and including “Thanksgiving Take Away Order” in the subject line. Yauatcha, 5045 Westheimer: The elegant-modern Chinese dim sum teahouse located within “the jewelbox” building at The Galleria mall is offering its typically petite-sized desserts in a large format for takeaway orders. The Pecan Tart Entremet is reminiscent of a pecan pie and bursts with crunchy pecans, rich dulce de leche, and vanilla cremeux. It costs $50 and serves eight to 10 people. Customers can place orders by sending a message to [email protected] or calling 713-357-7588, ext. #6 by Tuesday, November 20.